There has been a flurry of activity on the edges of the graphic design field in the US during the past three or four years. Many designers who came of age in the mid 1980s have now turned to writing and self-publishing as an alternative to client-based commissions and as a place to test the future of experimental work. Johanna Drucker’s career provides a formidable example of a practice built both between and within existing disciplines. Some of the formal devices developed in her artist’s books, which extend an established avant-garde literary tradition, overlap with experimental typography as practised by contemporary graphic designers. And fuelling her creative work is an impressive body of scholarship on the history and theory of writing as visual form. Drucker has been cutting a path through the terrains of art history, literary theory and the art of the book since the mid-1970s. Now aged 43, her career has reached a dramatic summit during the past two years with the publication of two major studies on the visual materiality of writing and a growing public recognition of her experimental books. In 1994 a complete series of her artist’s books was acquired by the Getty Center in Los Angeles, whose collection focuses on avant-garde printed matter. Drucker has arrived at art history through practice, and at design through art and writing. Her work offers a compelling model for approaching design as both a medium of experiment and a subject for serious scholarship. Drucker’s academic publications are legitimate scholarly endeavours, not the marginal products of an obsessed typophile or amateur historian, yet they are written in a manner accessible to designers, artists and others outside the university. In 1994 the University of Chicago Press issued her book The Visible Word, a definitive work on the theoretical sources of Futurist and Dada typography. In 1995 Thames and Hudson published The Alphabetic Labyrinth, a history of intellectual fantasies concerning the origin of letters, from the sublime to the ridiculous, the scientific to the spurious. Both books give design an important role in the realm of ideas by arguing that the visual features if the written word are themselves crucial to the formation – and deformation – of western art and philosophy. The Alphabetic Labyrinth was begun in 1980 when Drucker was a graduate student in the Visual Studies department at the University of California at Berkeley. Visual Studies, a tiny masters programme offered by the School of Architecture, attracted those whose interests fell outside the established boundaries of art and design. Drucker’s classmates included Zuzana Licko and Rudy VanderLans, who went on to pursue their own unusual paths in the areas of typography and publishing at Emigre. The Alphabetic Labyrinth, which is lavishly illustrated with Enlightenment diagrams and mystical speculations about the origins of the letter, is based on Drucker’s masters thesis. The Visible Word is also drawn from Drucker’s work at Berkeley – this time from a dissertation for a doctoral programme in ‘Ecriture’ that she pieced together using an unlikely team of advisers from the departments of art, literature and linguistics. After completing her dissertation in 1986 she took a series of academic jobs in art history, first at the University of Texas, then at Harvard, Colombia and now Yale, where she says she plans to stay. In Drucker’s experimental books, in which she draws on the model of the poet-typographer explored historically in The Visible Word, formal, rule-based systems confront serendipitous elements endowed with lusty humour and an intense bodily presence. The theoretical and the profane erupt, for instance, in her 1989 project The Word Made Flesh, in which voluptuous, massively scaled wooden initials inhabit a grid of tiny, precisely spaced Copperplate caps. Drucker’s games of illogical economy often push literature into the background, generating exquisite puzzles that are all but unreadable. From A To Z (1977) is an arcane pseudo-‘bibliography’ that parodies the work of poets from the San Francisco Bay area. Drucker feared she would have to leave town after the book’s release, but few of the targets of her humour recognised themselves in the obscure typography. Drucker’s romance with the book was sparked by letterpress, a tedious medium over which she is a tireless master. The limitations of traditional metal composition – from the strict lock-ups of the type bed to the limited inventory of the typecase – offered her a gilded cage from which to create her curious inventions. Her most recent letterpress book, Narratology (1994), combines the compositional freedoms afforded by Macintosh software with the material presence of letterpress. Drucker used QuarkXPress to produce polymer plates and coloured the illustrations by hand. Drucker started working with Apple Macintosh equipment in 1990. She remembers the production of her book Stimulant Portrait as a ‘technological nightmare’ as well as an initiation into new possibilities of typographic composition and manipulation. Stimulant Portrait, an unrestrained, almost naïve montage of photographs, texts, condensed capitals and bitmapped headlines rendered in black and acid green, was also her first collaboration with Brad Freeman, a photographer, printer and book artist then working with Pyramid Atlantic, the project’s publisher. Freeman and Drucker, who are now married, are turning their home in New Haven into a techno-mechanical laboratory of the book, with PowerMacs on the second floor and a metal type shop in the basement. The visual and poetic structures developed in Drucker’s experimental books tie in with her scholarly works. According to Drucker, The Visible Word fills a need in both art history and literary studies to look at typographic form. ‘I want people in the world of art history and the world of literature to know that typography belongs to both of these worlds,’ she says. Modern art criticism, which reached its point of highest elaboration in the 1950s and 1960s was based on a notion of phenomenal ‘presence’ – the autonomy and self-evidence of the aesthetic work. Critics such as Clement Greenberg banned narrative associations from the realm of visual art and argued instead for the completeness of the Modernist object – exemplified in Abstract Expressionism. By contrast, literary theory of the same period, invigorated by semiotics and post-structuralism, was grounded in a concept of ‘absence’ – the idea that individual signs have no inherent value, but depend on plays of difference within systems of representation. Roland Barthes and other critics, proclaiming the ‘death of the author’, pictured literature as a tissue of allusions caught in the web of ideology. 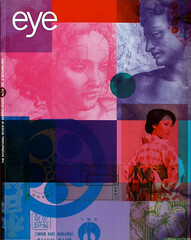 ‘One needs both of these approaches to understand the way a work of art- literary or visual – functions,’ says Drucker. ‘There’s the material fact of the work being physically present, inscribed as a corporeal entity. But you can only interpret this entity through structures of mediation and context.’ Experimental typography, by combining the visual and the verbal, the material and the symbolic, reunites two modes of expression that were cleaved apart by Modern criticism. Across the spectrum of avant-garde practice, artists have mobilised the printed medium as a tool of publicity and field for experiment. The physical form and social function of print made it an ideal platform from which to challenge conventional distinctions between literary and visual form and high art and popular culture. Drucker thus positions typography as not merely a strange interlude or incidental sidebar in the history of Modern art, but a crucial element of avant-garde strategy. The Visible Word points out that the Futurist and Dada poets borrowed formal devices from commercial graphic design. Putting type on the diagonal, incorporating dingbats into text, manipulating size relationships, mixing typefaces – all these techniques were part of advertising typography by the late nineteenth century. Drucker’s book shows how the avant-garde borrowed these vernacular devices and rendered them theoretically self-conscious in the 1910s and 1920s. Paradoxically, many of the same artists then turned their energy back into commercial art, creating a professional identity for graphic design by establishing schools, magazines and a canon on pioneers and great works. As a physical object, The Visible Word is a drab and dry academic book; The Alphabetic Labyrinth, is fit for a coffee table, with two-colour printing and hundreds of bewitching illustrations of letters, runes and hieroglyphs. The Alphabetic Labyrinth is an epic history of western thought from antiquity to the late twentieth century with letterforms in the leading role. Phonetic writing is a piece of intellectual technology with profound consequences for the civilisations it has touched. Valued for its brilliant abstraction – its ability to translate the sounds of nearly any language into a concise, repeatable code – the alphabet would appear to be the most rational and transparent of devices. And yet, as Drucker shows, the alphabet has been the subject of fantasies claiming that its forms mask a mystical purpose or figurative origin. Strange precedents for contemporary fonts made from icons and symbols can be seen in theories that tried to naturalise the alphabet by linking the shapes of letters to the organs of the mouth. The possibility of merging typographic experiment with mainstream publishing suggests the relevance of Drucker’s work to the practice of graphic design. In a period when many graduate programmes are trying to integrate serious research into design education without losing sight of practice, Drucker’s career illustrates one way of uniting divergent disciplines. Though her example cannot necessarily be adopted by designers frustrated with the intellectual limitations of the marketplace, those with similar skills and inclinations may find it easier to map their own routes now she has preceded them.